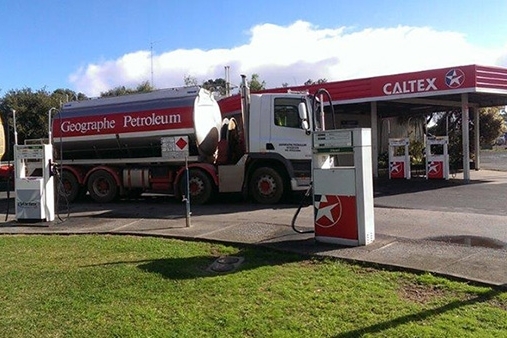 Geographe Petroleum has been your Caltex Distributor in the Busselton and surrounding area for 45 years. With two 24 hour sites and bulk fuel deliveries from Capel to Augusta talk to us today about your fuel and oil needs. Geographe Petroleum has been your Caltex Distributor in the Busselton and surrounding area since 1973, starting with Lyall and Val Johnston and being continued with Rodney and Julianna Johnston. As a 2nd generation business, we know your business needs and have extensive local knowledge of the area. Our Busselton site provides our customers with full Driveway Service and offers 24 hour fuel access via EFTPOS and other applicable cards. We supply bulk fuel deliveries servicing Retail, Commercial, Industrial, Agricultural and Marine Customers, along with providing Quality Caltex Oil Products. We also stock MacNaught and Alemlube lubricating equipment. Geographe Petroleum delivers from Capel to Augusta and through to Nannup plus everywhere in between. We provide a competitive and prompt service. Give Rodney a ring to discuss your fuel and oil needs.